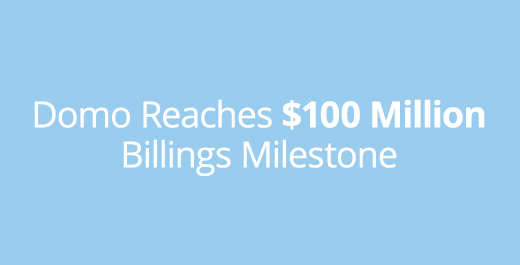 SILICON SLOPES, Utah – March 22, 2016 – Domo, the world’s first Business Cloud, today announced it has reached a milestone of $100 million in billings and has raised another $131 million to its Series D round at a sustained valuation of $2 billion. Existing investors from Domo’s last funding announcement plus Credit Suisse and other new investors also joined. This influx of new capital brings Domo’s Series D round to more than $330M, and Domo’s total funding to more than $590M. The funds will further advance the Business Cloud also announced today. Domo is the world’s first Business Cloud. The Business Cloud brings together all the data, all the people and all the insights business users need to run their entire business and make faster, better-informed decisions to improve performance. At the heart of the Business Cloud is the Domo Appstore, the premier destination for decision makers in any role or any industry to get answers to their specific business questions through easy-to-use, pre-packaged solutions built by a developer ecosystem. The company is backed with more than $500 million from the world’s best investors and is led by a management team with tenure at the world’s most well-known technology companies. For more information, visit www.domo.com. You can also follow Domo on Twitter, Facebook, LinkedIn, Google+, Instagram and Pinterest. Business Cloud, Domo and Domopalooza are trademarks of Domo, Inc.